The Indiana Historical Society aims to provide a welcoming and engaging experience for all guests of the Eugene and Marilyn Glick Indiana History Center. Please contact IHS at (317) 232-1882 with questions, concerns or to make advance plans for your visit. Complimentary admission is offered to licensed care providers. Service animals are welcome. Accessible parking is available in the surface lot at the corner of New York and West streets in downtown Indianapolis. There is a curb cut on the east end of the lot, near the Visitor Entrance, for guests to access the sidewalk surrounding the History Center. Power doors are located at public entrances on the main level and off the Canal Walk. Complimentary manual wheelchairs are available upon request. Please see Welcome Center staff for assistance. Motorized wheelchairs are welcome in the History Center. 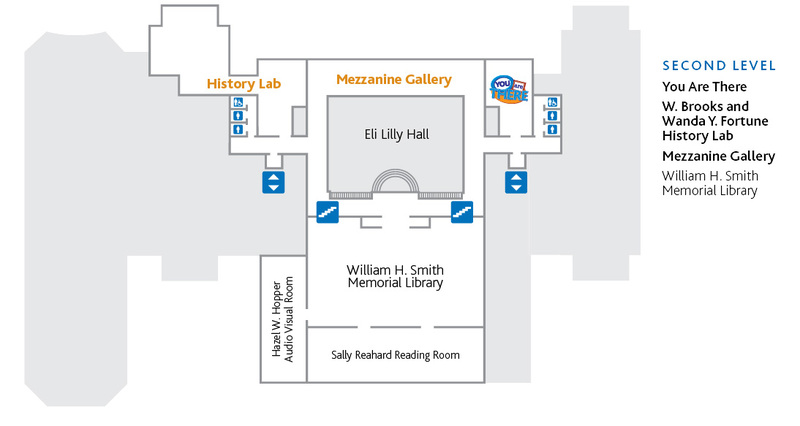 Accessible restrooms are available throughout the History Center. All restrooms have manual flush toilets. 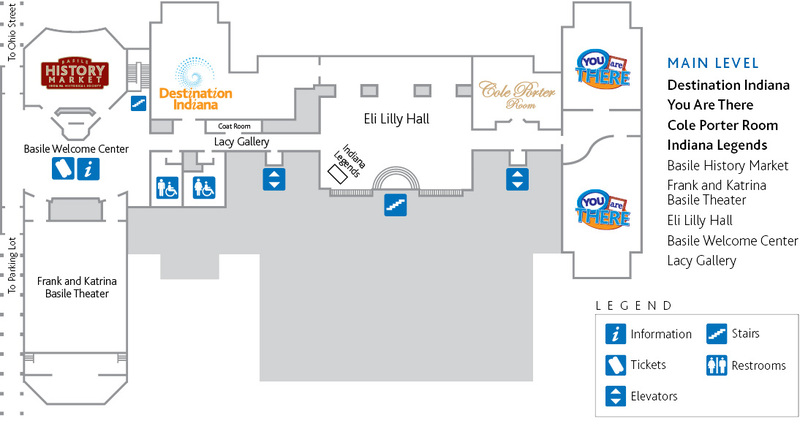 Public restrooms near the Welcome Center (main level) and Stardust Terrace Café (canal level) have automatic hand dryers, sinks and soap dispensers. Elevators are accessible to wheelchairs/power chairs and service all public areas. Accessible drinking fountains are located outside public restrooms. Seating is available throughout the History Center. Guests will find open captioning on videos throughout the History Center. Where captions are not available, staff can provide copies of text upon request. Braille signage is available near elevators, entrances and restrooms. Videos and digital interactive activities throughout the History Center feature narration or the option to turn on narration. Visitors who do not like bright lights may wish to avoid Indianapolis Colts: The Exhibit, which features floor to ceiling backlit images and several flashing displays. Visitors who do not like loud noises may wish to alert staff before entering You Are There 1863: Letter Home from Gettysburg, which features a film recreation of the Battle of Gettysburg. Visitors who enjoy tactile play and activities may wish to visit the W. Brooks and Wanda Y. Fortune History Lab, where they can try out one of the many techniques used to safely mend fragile paper. 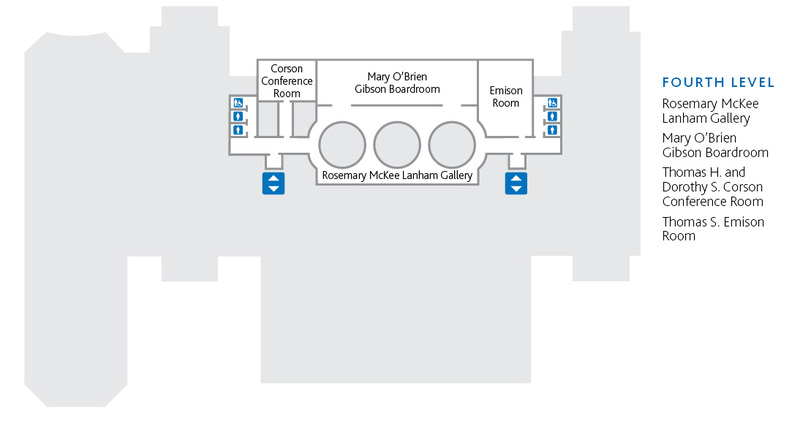 Visitors in need of a quiet area at any point during their visit should contact staff at the Welcome Center or seek assistance from any staff member in a blue shirt.